This genuine leather purse was made by Giani Bernini. The front flap has a decorative metal ornament and under the flap is a snap closure. The back has a full open section with a nice bone fabric lining. 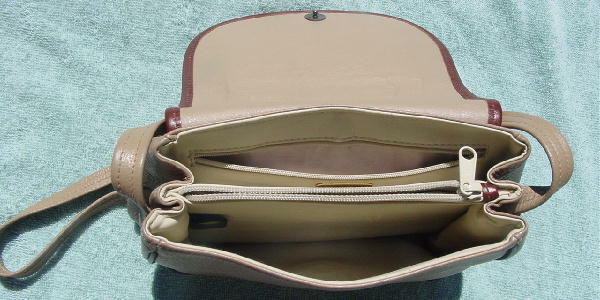 The interior has a front bone color section and center zippered compartment and a back section with a zippered pocket which has a fabric lining. It's in a sandy-tan heather with a brown trim. 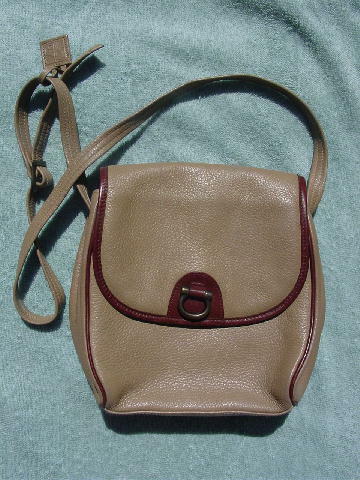 There is a 47" by 5/8" long adjustable shoulder strap.